No sunny Sunday this weekend, so why not head out to Durham for a half day of art and music. The Nasher Museum of Art has a free family day on Sunday 12pm-4pm. No specifics are given for this coming Sunday other than the date – you might want to call ahead. Kids activities are for ages 3-12, but all kids are welcome. A children theater group is scheduled for 1pm. Parents – use the opportunity to at least catch a glimpse of the current Calder exhibit! When you’re done with the museum and getting hungry, head over to Broad Street Cafe where Big Bang Boom is performing children’s music at 4:30pm. 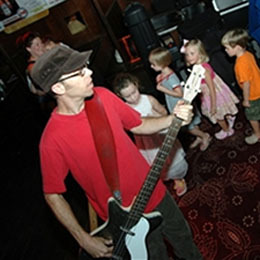 Big Bang Boom is “a power pop trio that writes and performs parent-friendly children’s music” according to the Broad Street Cafe website. No admission is charged, but please be courteous and show your appreciation by purchasing their food and drinks. This entry was posted in Art, Music, Stage by daddyweekly. Bookmark the permalink.